Yintech Investment Holdings Ltd. engages in the provision of online spot commodity trading services. It facilitates the trading by individual customers of silver, gold, and other precious metals and commodities on Shanghai Gold Exchange, Tianjin Precious Metals Exchange, and Guangdong Precious Metals Exchange. PE Ratio less than 8, recent growth in 3rd quarter 2016 was 65% year over year in earnings per share or 58 cents US. At a 4x run rate that is 2.32 per share, the stock trades at a PE ratio of 7.3x run rate of earnings! A move to 10x earnings would push the stock to $23 per share. Subtract out the $3 in cash per share and the stock trades at 5.8x earnings! This was an April 27th 2016 IPO of a Chinese precious metals exchange trading operation. Yintech was founded in 2011 and has grown substantially. The Chinese have a centuries old love affair with precious metals. There are over 300 exchanges that deal in the trade of precious metals in China. Yintech is the leader with only a 4% and growing market share, but with lots of room to acquire other exchange trading firms and build a larger piece of the pie. The company indicates in the original 2016 IPO prospectus that they plan to likely make selective acquisitions, and they made a large on in the 3rd quarter of 2016. They also are looking to expand into commodity trading markets as well. They also added a new exchange in November 2015 which has increased trading volume dramatically. For the third quarter of 2016, Yintech’s customer trading volume was RMB835.1 billion (US$125.2 billion), a 486.9% increase compared to the third quarter of 2015. Yintech generated net commissions and fees of RMB700.7 million (US$105.1 million), a 223.9% increase compared to the third quarter of 2015. 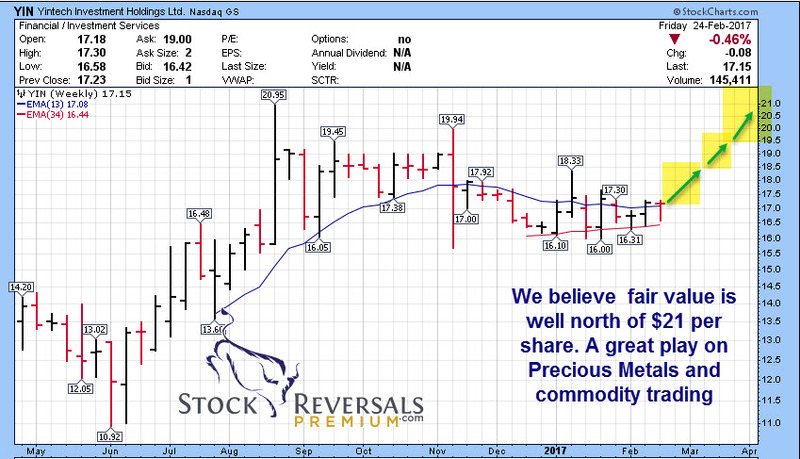 So our view is this is a way to play both a Post IPO undiscovered stock, the precious metals bull market, and a China recovery all wrapped into a stock with a PE ratio of about 7.3x our estimate of 2017 earnings and more like 5-6x earnings when we take out the cash per share. Fair value seems way above current levels, the stock appears undiscovered by investors at this time like MOMO was a year ago.